Right now our healthcare system operates mostly as a “fee for service” system, meaning that providers are paid based on the volume of procedures performed or treatments provided, without taking into account whether those things actually improve the outcome for a patient. Value-based care is the opposite—a system of medicine that focuses on the outcomes instead of the volume of care, ensuring patients get the highest quality care while also focusing on controlling the costs. This approach is designed around patients, with the goal of improving patient health while reducing healthcare costs. It’s about getting the right care, in the right place and at the right time. Value-based care leads to better health outcomes because it encourages patients to play a more dynamic role in their healthcare and promotes preventive care. Data helps providers identify gaps in care like a missed follow-up appointment or screening. Physicians are actively working to ensure you are receiving low-cost care without sacrificing quality. Data analytics and communication tools help providers navigate the best path for your situation so that you are getting the best value out of your healthcare dollar. A lower cost of care doesn’t matter if you aren’t also receiving the best possible care. In a value-based care model, physicians are measured on the quality of care they provide and how well they coordinate and manage your care. It benefits you as a patient—and them as physicians—to provide the best patient care. Why does value-based care matter? How Does Value-Based Care Benefit Me? Q: If healthcare costs less, does that mean the quality of care isn’t as good? A: Not at all. Reducing the cost of healthcare isn’t about cutting corners or taking shortcuts, but it is about being aware of the aspects of care that are the most expensive (i.e. emergency room visits, hospital readmissions, brand-name medications, etc.) and doing our part as healthcare providers to protect patients from unnecessary spending. Q: What can I do to reduce my own healthcare costs? A: The key to lowering your healthcare costs is being actively engaged in your healthcare. Visit your primary care provider once a year for an annual check up, stay up to date on your vaccinations, adhere to your medication schedule and follow your doctor’s recommendations. These habits help you stay healthy, which reduces your overall healthcare cost, but it also allows more opportunities for your doctor to detect potential disease early when it’s easiest and least expensive to treat. In addition, while healthcare costs can seem confusing and difficult, it’s important for consumers to demand transparency from their providers on how much treatments will cost and whether those treatments are shown to improve patient health. Knowing costs in advance can help you compare treatment options to make the best decision about your care. Q: How do I know as a patient that I’m receiving the best possible care? A: Providers and healthcare systems that participate in value-based programs with insurance companies are incentivized to improve the quality of your care and lower your costs. In fact, your providers’ pay is dependent on their ability to reduce your cost of care, but only if they also improve your health outcomes and maintain a certain level of quality. As an Accountable Care Organization, Revere Health is also required to report on our quality outcomes every year for patients within that program. Q: How is value-based care different than any other type of care? A: Value-based care programs hold providers to a higher standard of care. Providers are expected to meet certain quality benchmarks, use advanced data to identify their patients’ risk, encourage preventive care and screenings, improve patient satisfaction and use technology to more effectively coordinate care. Q: Where can I go to make sure I’m getting the best price for my care? A: You have more options today than ever before when it comes to your healthcare. If you need immediate medical attention, for example, you may opt for an urgent care facility instead of the emergency room. On average, ERs cost up to 20 times as much as an urgent care center, depending on the treatment you need. If your doctor orders a procedure or test for you, ask if it can be done at an ambulatory care center instead of a hospital to reduce your costs. Q: If my insurance covers the cost of my test or procedure, does it really matter where I go for care? A: Absolutely. As the price of healthcare increases, so do insurance premiums. You might not see those costs immediately as out-of-pocket expenses—when your insurance covers a test or procedure done at a higher-cost facility, or it pays for unnecessary care that doesn’t improve your health outcomes—but paying more for your care today affects you and everyone else in the future as insurance premiums continue to climb toward unsustainable levels. Patients have increasing access to different tools that help them navigate the ever-changing landscape of healthcare. Are you taking advantage of these resources? A patient portal is a secure site or app that gives patients access to their medical information anytime, anywhere. Follow My Health (FMH) is Revere Health’s patient portal. Patients can use it to view their medical records, refill their prescriptions, document health notes and events, and communicate with their providers. Follow My Health is a highly beneficial tool to help you stay on top of your healthcare, save time and be healthier. Log on to Follow My Health or set up your Follow My Health account. There’s a lot of information out there about health and wellness. Use this resource to find thousands of health-related topics—peer-reviewed by doctors—explaining diseases and conditions, diagnoses and treatments, surgeries and procedures, and other wellness and safety information. You can also use this resource to answer your medication questions. By choosing to make smart healthcare decisions, we have the ability to reverse rising healthcare costs. 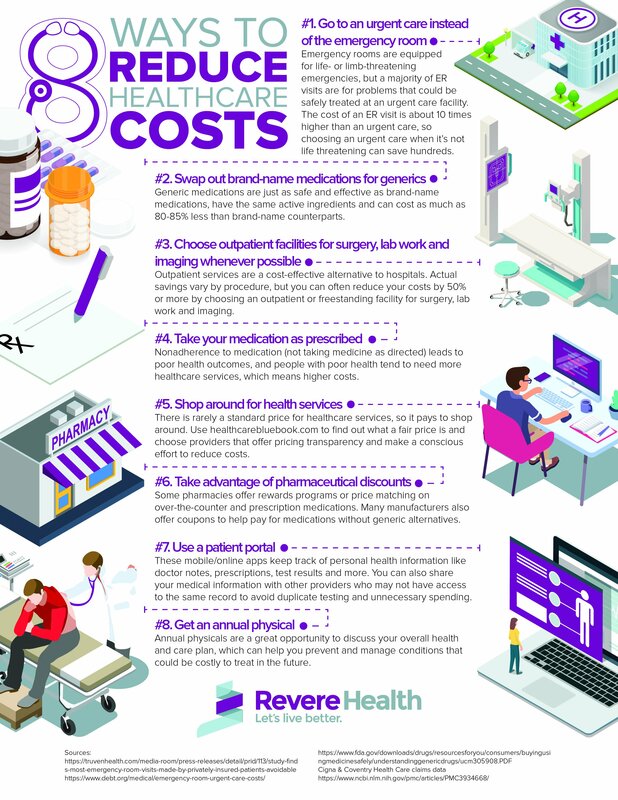 Below is a downloadable resource with tips to help reduce the cost of your care. Even small changes can make a big difference in your physical, mental and financial health. CLICK HERE for more tips to help you create sustainable change for a healthier 2019. Healthcare is just like any other service industry. You wouldn’t sign a loan on a car without knowing the final price, but many patients agree to treatment options without having any idea what the total costs will be. Choosing providers and organizations that are transparent about the cost of their services upfront, and asking for more transparency from healthcare providers that don’t make that information readily available, means you can be sure you are getting the best price as a consumer. You can find pricing for a wide variety of procedures at Revere Health here. Most people get care from more than one provider, and sometimes in more than one health system. If this applies to you, it’s important to find care providers that share information with each other electronically. This makes your medical information more accessible and your care more convenient. See if your provider is part of Utah’s Clinical Health Information Exchange (cHIE) here. If you need extra help remembering your treatment instructions or the the next steps from your doctor, you may benefit from taking notes during your appointment. Use this sample worksheet if you aren’t sure what to write down. Navigating the healthcare industry can be tricky. Use this glossary to better understand your health insurance, know where to go for care and learn about other important health information. A health savings account (HSA) allows you to make tax-free contributions to a medical savings account. HSAs are available to taxpayers in the United States on a high-deductible health plan. You can use the money to cover qualified medical expenses and the money rolls over from year to year. Learn more about HSAs and calculate your savings here. Community resources are available to help you get the care you need. Find links to these resources at 211utah.org and from these Healthcare Hotlines in Utah.